I have the ultimate pleasure as well as the ultimate terror of being able to visit City Pharma, the most famous pharmacy discount store in Paris, on a regular basis. No matter what season, time of day, or day of week, City Pharma is ALWAYS BUSY. Women trample over each other and block aisles just to try to decipher and then pillage celebrated French skin care products. Sadly, if your French is bad and you didn't do your research beforehand, it's gonna be hard for you to understand what products are, as their descriptions are mostly written in French. However, over the years, I have seen products become more bilingual with English descriptions next to the French. Usually, you'll find German or Italian bilingual instructions instead. I don't know why. I suggest going to Forvo.com to hear the correct pronunciation of these words or at least copy them down. If there's a French translation you're not too sure about, ask me about it in the comments! Luckily for me, Caudalie has bilingual products in French and English (most of the time!). They have a wide range of products, depending on your skin type and especially your age. I have tried a little of the Vinosource line, but not enough to give a solid review. This line is more for younger adults (under 30). 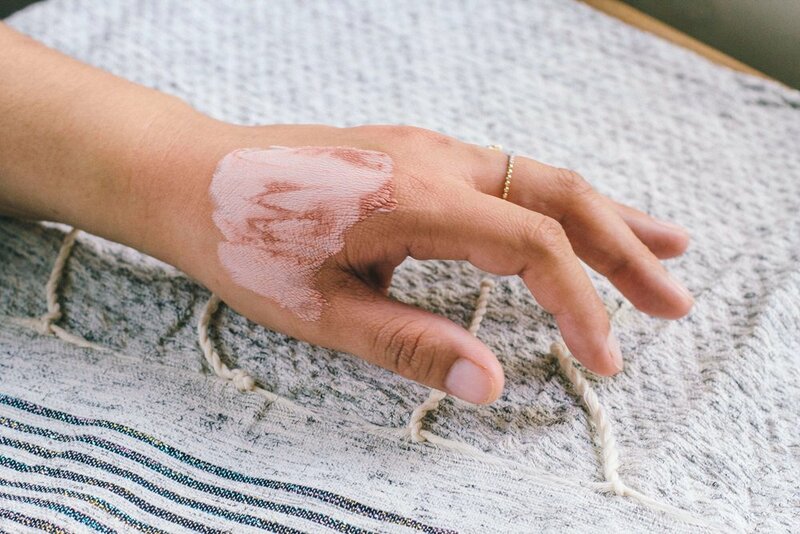 However, it seems to me that Caudalie mostly specializes in aging treatments and those other lines are much more expensive as well as intensive. This time I was more interested in trying out their facial masks, the well-known Eau de Beauté, and their Divine Oil (a rival to the Nuxe Huile Prodigieuse). After my tests, some of the results were surprising and oftentimes, in a good way! Note: I don't currently write promotional posts or use ads on my site. So this review contains my honest opinions! Caudalie is famous for its wine-infused products. Using vine and grape extracts as boosting agents to deter aging and skin damage, it is a sought-after brand for a reason. We hear all the time how much wine can be good for us (although in reasonable amounts! ), so why wouldn't it be possible that wine could benefit the skin? 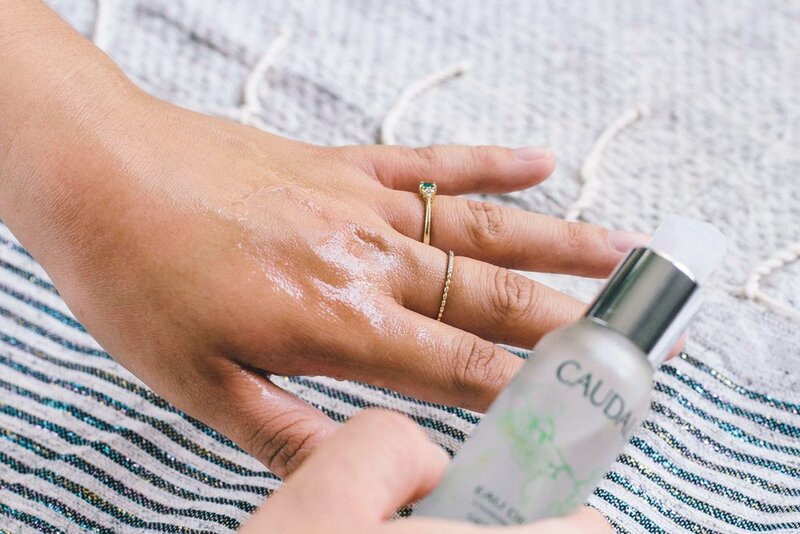 According to the Caudalie website, the vine and grape extracts contain "powerful anti-oxidants" for your skin, helping to soothe away wrinkles, fine lines, and dark spots. Moreover, these grapes are coming from famous wine regions in France, such as Bordeaux, Burgundy, and Champagne. Another great highlight about Caudalie is its embrace of eco-friendly and sensitive-for-the skin ingredients. You won't find parabens, mineral oils, sodium laureth sulfate, or animal materials in Caudalie beauty care. Another great thing about the brand is that they don't test their products on animals. Caudalie's products are very scented, so if you don't enjoy delightful musky vanilla, citrus, grape, or herbal smells, this brand is not for you. I personally have no problems with scented skin care but I know that certain people are highly sensitive to these types of products. I'm not sure all of Caudalie's products are scented, so you may want to look up this information on their website. Whenever winter approaches, my skin slowly starts to dry out. So I was delighted to try another moisturizing mask. I currently use the Nuxe Crème Fraîche de beauté (review here). This mask is supposed to "intensely nourish and soothe" as opposed to Nuxe's cream that claims it "rehydrates and relaxes" the skin. The instructions for the Caudalie mask were also slightly different. You have the choice of leaving the mask on for 15 minutes or overnight. If you do take off this mask after 15 minutes, you'll want to use a thermal water spray or gentle toner (a French toner here is not an astringent, at least not in the stinging, alcohol-infused way we know it in the States). I usually like to keep my moisturizing masks on overnight, if possible. The Nuxe mask is only supposed to "stay on" for 10 minutes and afterward, you rub it into the skin or again use a gentle toner to cleanse. I leave that stuff on my face overnight anyway, which technically is allowed. So I treated this Caudalie mask the same way. I left it on my face overnight. The smell is nice-- a light, citrusy scented cream that goes on smoothly. The texture is somewhat thick and takes time to absorb into the skin. I'm sad to say I didn't find this cream as moisturizing as the Nuxe mask. When I woke up the next day, my skin was just okay and not as moisturized as I wanted it to be. Still, it's potentially a great product. If you have oiler/normal skin, I would say this mask is more for you. For dry-skinned women like me, it's not a winter intensive cream and might be better suited for summer. I was surprised to find out that this was a clay mask. It doesn't really say in the product description what it was and I was too lazy to glance at the ingredients. However, I choose sample sizes for my tests and perhaps the normal sized products have more information. Clay masks are not a bad thing at all, so it was a pleasant surprise. Putting on this clay mask was quite a luxurious feeling. It had a nice herbal scent to it... reminiscent of when I went to visit the vineyards of Burgundy. Usually clay masks are really awkward and the texture disgusting, like the wet soft mud it's supposed to be. Caudalie took it up a notch as this clay mask spread on just like a cream. While I do love clay masks, I really hate how they harden on your face, trapping you as if you were becoming a statue, and then crumbling off if you make any facial expressions. With this face mask, I didn't feel that way at all. My skin was a bit stiff but not so terrible in that I could still move my face and not destroy the mask at the same time-- another highlight for this mask. You can leave it on for 5-10 minutes. I choose 10 minutes or at least until the clay dried. Washing off the mask is also easy, although like all clay masks, it comes off slowly with lots of water (note: I would use normal sink water to wash this stuff off and then douse the face with thermal water as a finishing touch). After drying off my face, my skin felt really dried out. This was kind of disappointing to me. However, since it is a deep cleansing mask, my skin did feel very cleansed (although overly cleansed). I wouldn't exactly give this product a negative review. After putting on my nightly moisturizer (Avène Crème nutritive compensatrice, review here), my skin felt pretty refreshed and renewed. I think that this mask must be part of a process/regime and is not a stand-alone mask, which is fine with me. I'm going to try the detox mask again, but aim for 5 minutes instead of 10. This glycolic peel was my my absolute favorite of all three. I have been using it weekly now (once a week for at least 2 months) and it has helped get rid of sudden bursts of acne as well as horrible blackheads. I was expecting a clear serum, but instead this mask is yet another luxurious cream with a soothing texture. Much to my surprise, it didn't harden or turn plastic-y, but acted just like a hydrating cream. You're only supposed to keep this mask on for 10 minutes (make sure to avoid the eye area). If you leave it on for more than that, I think would cause irritation as we all know glycolic peels should not stay that long on the face. So yes, wash it off! I'd use regular water and then top it off with a thermal spray, like with the clay mask. This glycolic mask absorbs pretty fast into the skin so it makes it easy to forget you need to wash it off. So don't forget! Most importantly, this mask didn't dry out my skin. It feels fine to go to bed without using a moisturizer after using this product, but I do it anyway as part of my nightly skin care routine. Lisa Elridge has a wonderful video on French skin care (look here) and really popularized this facial spray. And I believe she did it for a good reason because this spray is seriously the most aromatic, soothing, calming, and beautifying product I've encountered in my life. I don't know if Caudalie would classify this as a toner, but it does act like one (and again, not in the terrible, astringent/alcohol-based way). Supposedly inspired by Queen Isabelle of Hungary's beauty regimen, this spray is meant to give radiance to dull skin, tighten up pores and fine lines, and even out your skin tone. However, for me, Eau de Beauté does more than that. I'm sorry some of these photos are a little shaky. I tried to take them myself before Petit Copain came to the rescue and took the other photos. So a BIG THANK YOU to him. Anyway, let's get on with my final review. Everyone obsessed with French pharmacy products always gravitates to the Nuxe Huile Prodigieuse. It is a wonderful oil for the body, face, and hair... I especially love using it in my hair. This Nuxe oil also comes in a sparkling form, perfect for highlighting bronzed skin after a sunbathing session at the beach. However, I've been reading other accounts that Caudalie's Divine Oil is far more superior. I had to pick it up with my other Caudalie products to find out. It's not pictured in the photo above, but I tried the Divine Oil simultaneously with the Nuxe oil. I put the Nuxe oil on one leg, and the Caudalie on the other. I have to sadly say, Caudalie's Divine Oil is the winner. The Divine Oil has a nice, musky, vanilla and citrus smell to it. It's not a heavy or thick oil. Even better, it's not even greasy! For a few seconds, it's a bit oily like you'd expect, but the Divine Oil absorbs so fast into the skin, I was so impressed. Nevertheless, its fast absorption didn't mean it left my skin dry. In fact, throughout the day, my leg felt moisturized, smooth, and silky. The Nuxe oil is a little different in that you can spray the product on, which is nice. For the Divine Oil, you have to slowly pour it out, kind of like a fine olive oil. This can be tricky for clumsy hands. Still, a major difference between the two oils is that Nuxe is more greasier and stays greasy on the skin. It doesn't absorb as well as the Divine Oil. Although Nuxe's oil keeps the skin hydrated and gives it a nice shine, I think I'm going to be switching over to Caudalie's version, at least for the plain oil. I hope that Caudalie will release a sparkly version like Nuxe for beach-kissed skin. I have yet to test the Divine Oil on my hair, but I have a feeling it'll be great too. Thank you for reading my reviews. I'll be posting again soon. À bientôt, my dear readers!